How can you capture that “HUMP DAYYYYYY” in print? You cannot. Words could never do it justice. Schrell has been on the roster at the Millertown Pike McDonald’s for almost a decade, and started donning costumes for her drive-thru shifts several years back. The get-ups are unpredictable (“If I wear a normal hat, they wanna know where my hat is!”), with the exception of Wednesday, which is the day she wears a camel hat and yells “HUMP DAAAAAYYYYY” a lot. Other than the camel hat, she never wears the same get-up twice. Schrell told the network she always puts out her costume the night before, and gets up early to get ready: “You gotta put effort into everything,” she said. Cheers to Gay Schrell, drive-thru delight. Cheers to all the people who call McDonald’s to compliment her work. 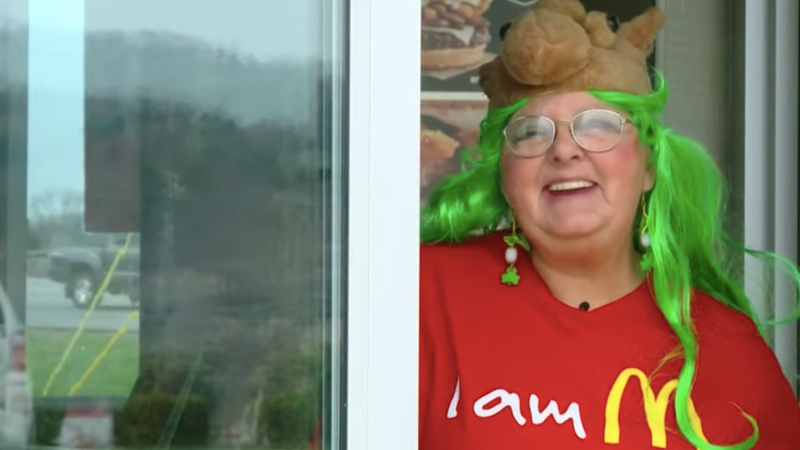 Cheers to the younger McDonald’s employees who affectionately call her “Grandma.” Cheers to whichever WBIR producer decided to shoot her interview from outside the drive-thru window, because that is charming as hell and a nice framing device. Cheers to nice folks who work at fast food restaurants who are nice to others.